A high-octane blend of design thinking, entrepreneurship, and a series of sprints can speed time to product/market fit. The signals are everywhere — press, macroeconomic indicators, and investment activity itself — that a new crunch is coming: raising a Series A round is already difficult and is about to be even more difficult for the vast majority of early-stage startups. Even those with good funding and reasonable traction. The bar is continually getting raised for what kinds of outcomes startups need to show to traditionally-oriented VCs to demonstrate they are the rare shining star worth backing in an inclement environment. This environment is leading early stage entrepreneurs to take a variety of approaches — primarily larger and larger seed rounds — that buy them time before they need to raise an A. 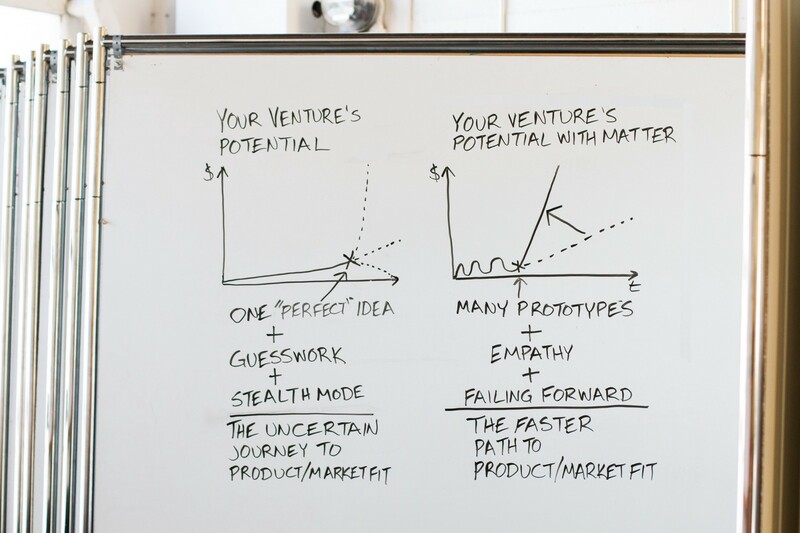 At Matter Ventures, we have a different prescription for how to be in position to nail Series A: Venture acceleration. Some entrepreneurs tend to think of accelerators as incubators that bring together early stage teams who might or might not have a product developed to help them figure out what to build and hopefully make them shiny enough to raise a seed round. We don’t. We’ve seen, quite contrarily, that it’s possible to reap the benefits of a well-structured accelerator program at almost any point prior to product/market fit. Across our five accelerator classes to date we’ve helped some companies that had already raised sizable seed rounds (up to $1.5 million), in addition to a great number of pre-seed startups. They came to us to help clarify their product/market fit and drive to the next phase of growth. Acceleration isn’t incubation. It’s about getting where you’re headed faster. And the only accelerator worth joining is one that has far more to offer than a check and free space (though we have that, too). 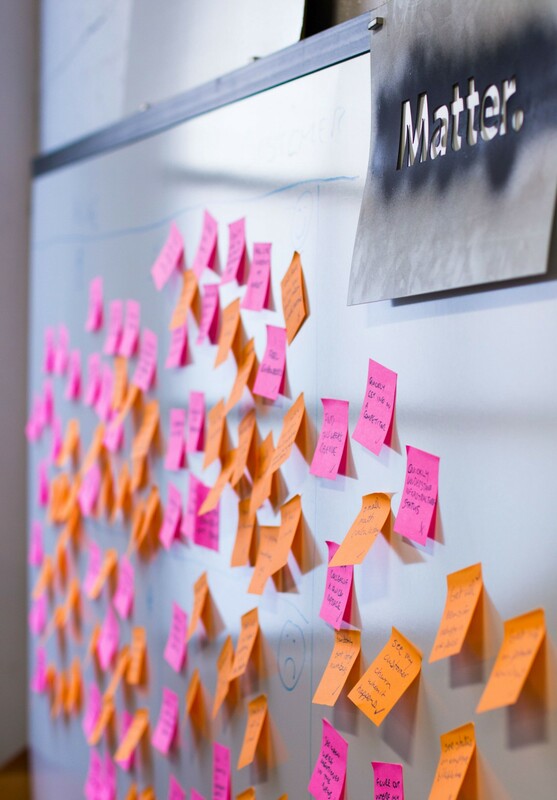 At Matter, our program is specifically designed to help our portfolio companies reach product/market fit better and faster than they could simply through existing operations, funding, and their advisor networks. It’s really intense, but it tends to pay off. Here’s why it works, and what sets it apart from venture capital as usual. Our program lies at the intersection of design thinking, entrepreneurship, and the future of media. The first piece is absolutely critical. Across five months, we provide a highly structured, practical, and hands-on curriculum in design thinking that has reshaped, redirected, and clarified the paths of our entrepreneurs. Because design thinking is fundamentally driven from a human-centered point of view, its lessons don’t apply only as you push toward a first beta. Design Thinking can apply to sales strategy, fundraising, geographic expansion, and hiring practices. The teams who come through our program leave with a skillset that keeps them moving faster for years after they launch out of our program. The Lean Startup popularized the notions of product/market fit as well as of rapid prototyping and iteration in the startup world. While a useful approach to developing new product features and checking an initial audience’s reaction to possible new directions for a startup, the missing piece has been rooting these initial assumptions and hypotheses in the needs of real people, and their emotions. Without this essential empathy, lean startups often find themselves optimizing toward the best version of what they decided to create without having ever figured out if it’s what they should create. In essence, the lean start-up is a great way to get to a local maxima, but not necessarily to a global one. When you start by understanding the people who will use and purchase your potential offering, it’s a lot easier to build and test the right prototypes that can maximize desirability, feasibility, and viability. It beats creating out of thin air and optimizing every time. Any team coming into acceleration with a solid team and initial concept (even a very flawed one that might get killed along the way!) can come out the other side with product/market fit. Because we encourage post-seed companies to participate in our accelerator, we often get asked how our highly structured program could work with companies that have wildly different needs relating to their traction and stage. While our process is highly structured, this approach was created to provide value to work for startups at different stages of growth. No cohort of startups is ever in the same exact place. We meet the teams where they are. If that means that their design sprints are focused heavily on recruiting new hires, sales meetings and marketing materials, so be it. If they haven’t nailed their customer needs yet, they don’t spend all day working on their product. If they realize their current idea isn’t good enough and they need to kill it and start over, they’re encouraged to do so. The bottom line is that they are forced to always be addressing their key risks and key success factors, because a start-up shouldn’t focus on anything else. What matters is equipping them with a toolkit that allows them to assess their progress, and take the right set of next steps while maintaining an eye toward long-term goals. It’s about speed, not stage. When we evaluate companies for our accelerator, we judge whether they’re right for us based on the skillsets and track record of the team and our excitement about their products and services, naturally. More than anything, though, we want to see that they possess the mindsets and the drive to navigate the fog of entrepreneurship: they’re mission-aligned, highly collaborative, user-centered, prototype-driven and ready to walk through the desert to change media for good. They crave dedicated time to work closely with and internalize the feedback of our mentors and the media organizations that back us. They view feedback as a gift. And they want to reach the next stage of their growth much faster than they could at their current pace. They have the need for speed, whether they’ve got a shipped product and $1.5 million cash on hand or they just have a dream and a paper prototype.